So, we were very much looking forward to our first real vacation of the year! With a handful of big changes happening in the household this year, we were hoping to save up a little and thus only planned on visiting nearby countries for the time being. Yet, we still wanted to go somewhere where we knew the kids would have a blast and the four of us could enjoy some quality bonding time as a family before the baby comes along. 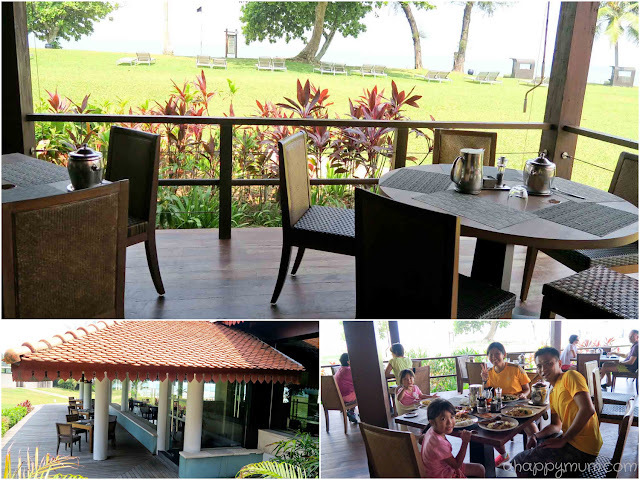 Now, how does an all-inclusive holiday in a kampong-style beach resort sound? The only word I could think of was heavenly. Can you guess where I am referring to? Yes, we were going to visit Club Med Cherating Beach! 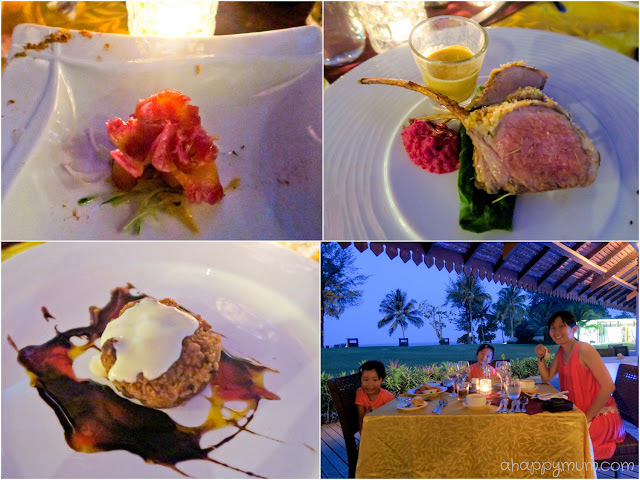 After our fantastic experience in Club Med Bintan last year, we were thrilled to have the opportunity to visit Club Med again and couldn't wait to set off right away! After some thought, we decided to go on a road trip and drive our way up to Cherating, which would take us well over six hours. Considering how we used to go on frequent road trips back in Europe, we figured out we would do fine as long as the car didn't break down. In order to keep the kids entertained on the long ride, we brought along their car table bags, snacks, drinks and even a set of cooking toys! According to Google Maps, the shortest route would be to drive via E2 towards Kuala Lumpur and then through Lebuhraya Segamat along Route 12. To guide you along the way, you can download the Sygic app on your mobile which will enable offline GPS navigation. Of course, it's not really possible for the little ones to endure a 6-hour journey so in addition to a couple of pit stops, we also decided to take a break in Yong Peng where we had lunch in the famous Yuan Yean Fishball Eating House. 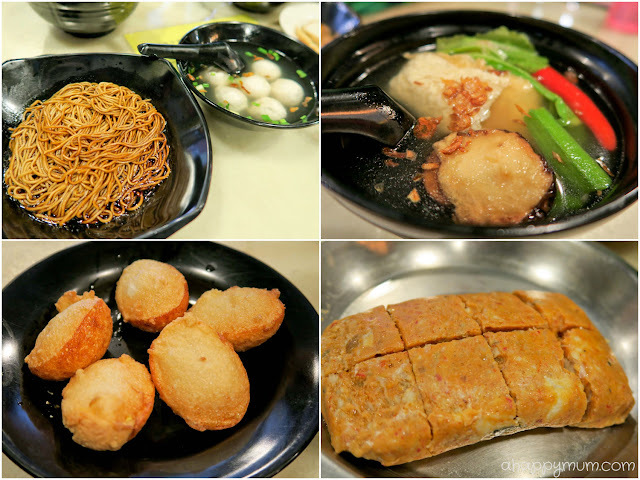 Well, I can't say we were too impressed by the food and the fishballs had a fishy taste too strong for our liking, but we did enjoy the fried peace eggs and muah otah-otah. Anyway, we continued our journey after that and I have to tell you that things didn't go as smoothly as planned. Alas the hubby had to overtake quite a number of heavy vehicles carrying logs and sand along the way and when he tried to go into sports mode to accelerate, we realised to our dismay that the engine became faulty and soon the car started to vibrate. Scary, right? It was then already 3pm in the afternoon, six hours after we had set off and we were 100km away from our destination. 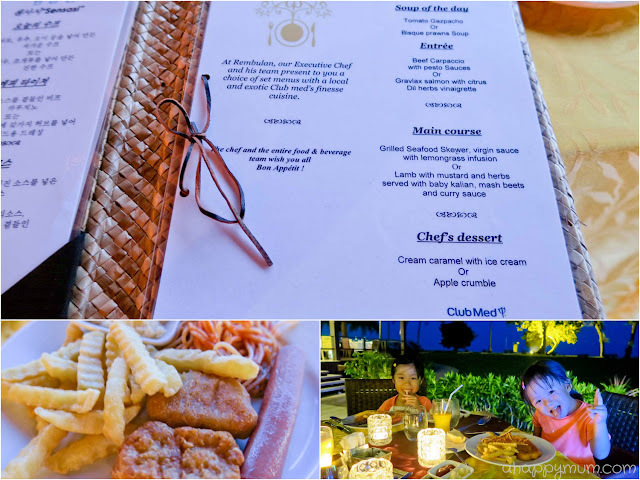 So despite not getting off to a great start, we heaved a sigh of relief and were too happy beyond words when we finally arrived at Club Med Cherating Beach at 6:30pm. Woohoo! It's definitely better to be late than never and we were thankful that the holiday could go on as planned. For the record, I do think that driving up here is a good option if you wish to save up on air tickets and don't mind a bit of a ride. Just make sure that the car is in good condition, set off early and have some breaks along the way especially if you have young kids. Cherating is a beach town in Pahang, Malaysia, located about 47 km north of Kuantan. It has a cultural village, a turtle sanctuary and is one of the wettest places in Malaysia with heavy rainfall all year round. 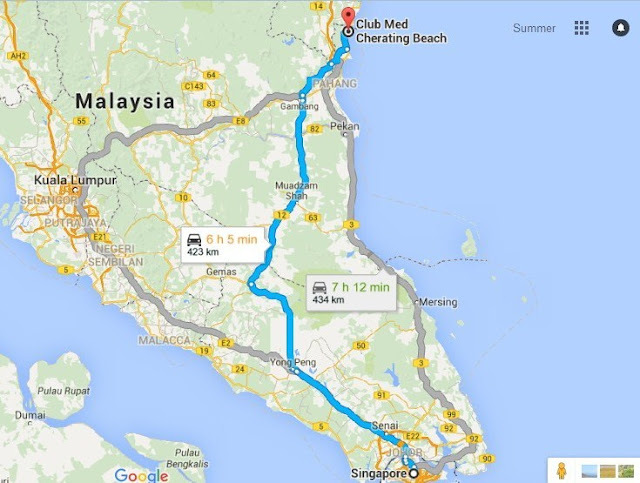 If you are flying to Club Med Cherating Beach, the nearest airport would be Kuantan Airport and it would take you a 45-minute shuttle to get to the resort. Club Med Cherating Beach is said to be a tropical Eden in a protected jungle area by the South China Sea. For those who don't know, it is Asia's first Club Med and is now a 5-star all-inclusive beach resort since its reopening in 2004. As Club Med's first eco-nature resort, it includes 80 hectares of tropical forest and four kilometres of pristine beach. 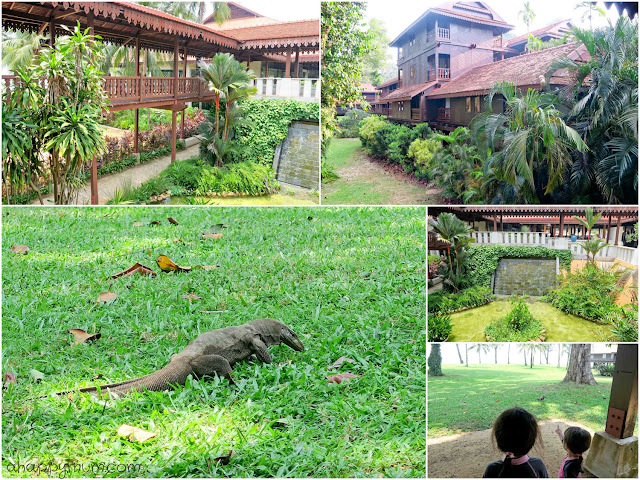 If you and your family are nature lovers, then this can be considered as a holiday paradise. What struck me first about the resort was how the bungalows were built of timber and perched on wooden stilts, how traditional in style, right? 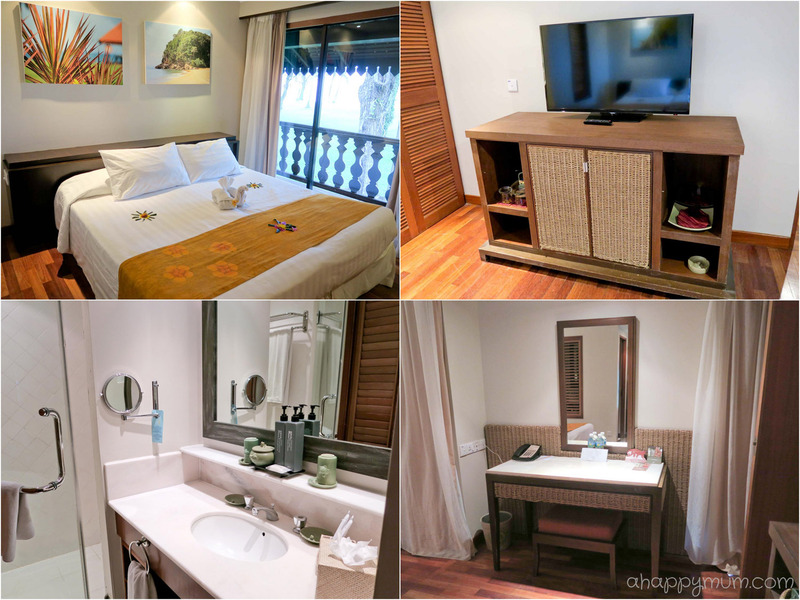 Although the resort goes under refurbishment nearly every year, I am glad that they still retain the kampong look and feel though I can imagine how much time and effort go into maintenance alone. 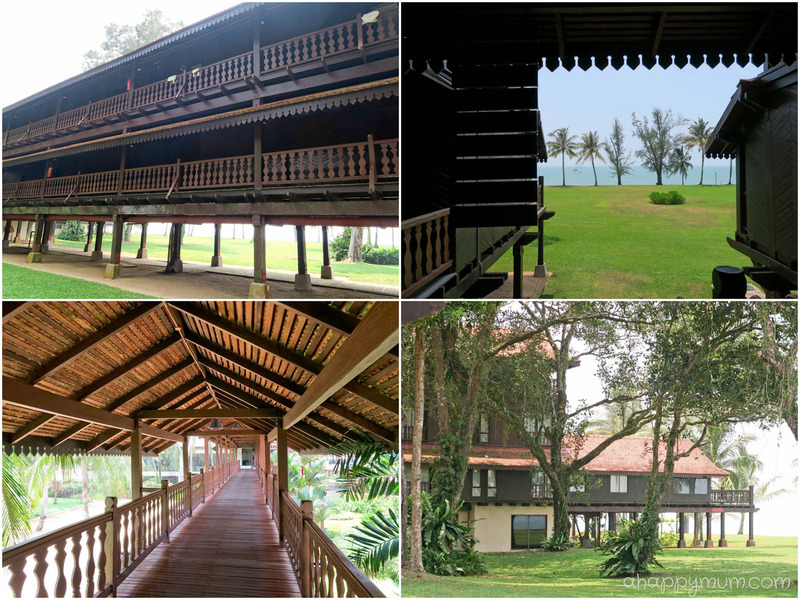 The corridors also seem to be never-ending and I found out with fascination that Club Med Cherating Beach boasts the longest building on stilts with a 850-metre long corridor in the Guinness World Records. The Gentil Organisateurs (GOs) who welcomed us told us that we had to keep our room doors locked, not just shut, at all times because we would be surrounded by macaques and these monkeys had mastered the art of opening doors, climbing up balconies and getting into rooms. Sounds frightening? Well, we thought it was more amusing but then again, we never did see any near our room though we saw a few in the main building. Nonetheless, we did spot several monitor lizards right below where we stayed, which thrilled the kids every time. Abundant wildlife, tranquil natural surroundings, peace and quiet relaxation coupled with fun-filled, exciting activities - these are just some reasons that make Club Med Cherating Beach such an appealing destination filled with the wonders of nature. Isn't it great to still see their happy smiles after that long ride on the road? Upon having our welcome drinks and an introduction about the resort by the GOs, who kindly helped us settle all our luggage, we checked into our room without any hassle at all. I was pleasantly surprised to see that the GOs already had our room keys prepared for us after finding out our car license plate number, and thus our names and reservation, from the security guard. So, we didn't even need to go to the reception counter and could proceed to our room directly, much to our joy. The resort comprises of 297 rooms which are divided into 15 three-storey buildings. We stayed in two Sea Side Club Rooms which were interconnecting and had ample space for the kids to move around. Yes, separate toilets meant that in each room, the toilet was separate from the shower room which can be a good thing if you think about it. Having two rooms also meant that we had two toilets and two shower rooms so there was no need to rush or to squeeze both kids into one small shower area. 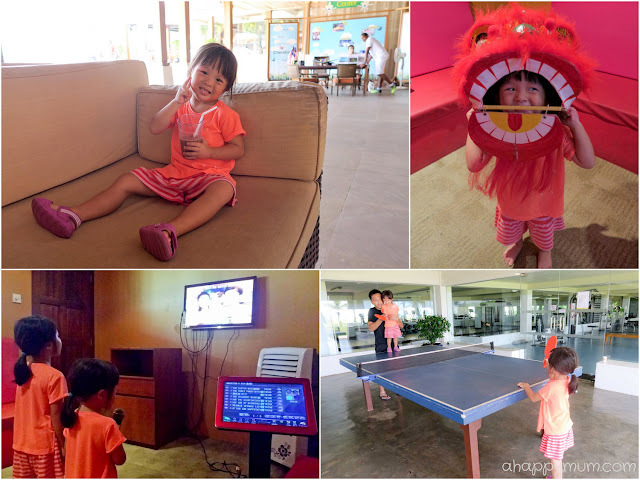 I can't really say that the rooms were kid-friendly since we had been to others which had toys, entertainment, games, cartoon bed sheets, kid-sized bathrobes, kids' toiletries, step stools and bunk beds to delight them. However, we knew fully well that our rooms would purely be a place to sleep and rest and for majority of the time, we would be out having fun somewhere else. So, the rooms definitely sufficed to meet our needs. One thing to take note, although there is complimentary WiFi for all guests, the connection can be quite choppy, or there can be none, especially if you stay far away from the main building. We were lucky that we could get a signal from our rooms but we realised that in many parts of the resort, we would not be able to log in. Well, that might be a good thing if you intend to focus on relaxing and spending time with the family, right? Anyway, just so you know, the best place to get a good WiFi connection will be at the lobby and the main bar area. Not surprisingly, it didn't take us that long to settle down and once we we got into the swing of things, it was time for some fun-filled action and adrenaline rush! Bring it on, baby! We signed Angel up for the Mini Club, which is included in the stay package, and children aged 4 to 10 can join in activities including sports, cooking, art and craft, dance, show performance, and even have lunch and dinner with newfound friends and GOs. I was really looking forward to letting her try out new experiences like kayaking and treetop adventure but was informed by the GOs that these activities were meant for children aged 6 and above, and even though she was only two months short of turning 6, she would not be allowed to take part. Oh well, I guess that's just a reason for us to come back again next time, right? Anyway, it turned out that she told us she would prefer to spend more time with us, her family, on this holiday and there was no way I could reject her since that was all I wanted to do too. 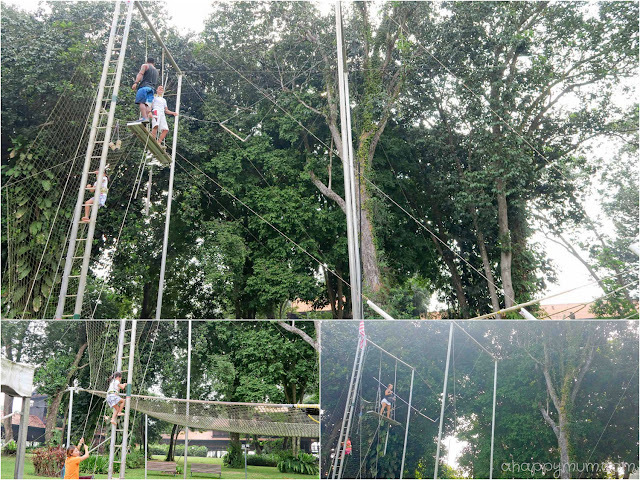 However, I knew she would enjoy doing the outdoor activities and so every morning, the first thing we did was to let her join in the trapeze and circus activities. 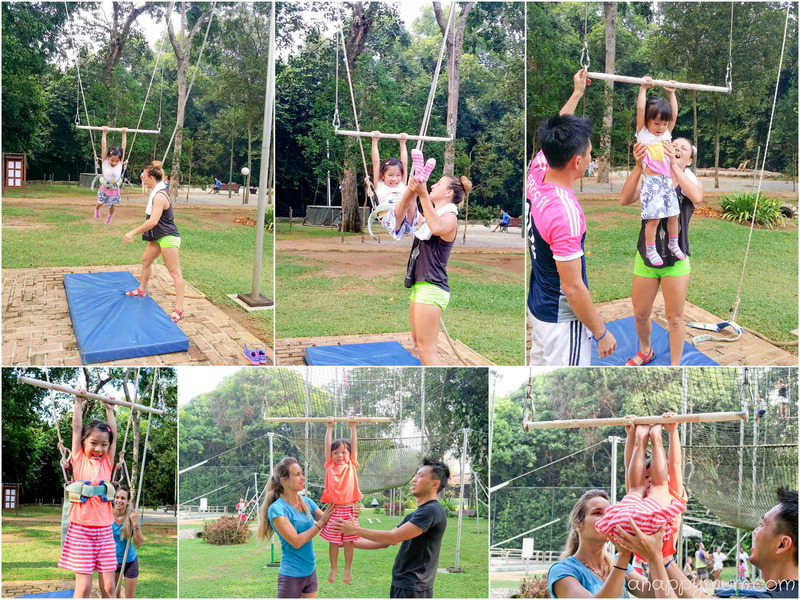 Besides the flying trapeze, both the girls also got to go on the stationary trapeze and even learnt to do stunts, thanks to the help of the circus team, especially Elizabeth who fell in love with the kids and was so kind to them every time we met. They attempted to put their feet up the trapeze, hang upside down and flutter like butterflies! Yay! The big girl managed to hook her legs onto the trapeze and let go of her hands, even if was just for a few seconds! In addition, the girls were also excited that they got to go on the bungee bounce and have some bouncy fun! Angel went really, really high up! As for Ariel, well she could only jump on the trampoline since she was too small to fit into the harness but in spite of that and the fact that they had to take turns, both of them couldn't stop laughing whenever they went on it! The swimming pool and hot tub are ideally located in the centre of the resort and come equipped with deckchairs and parasols. 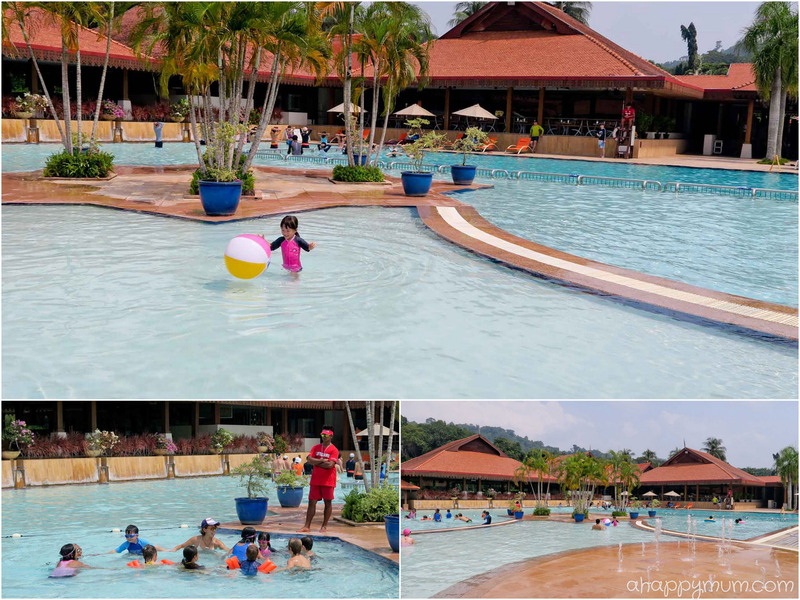 The deep pool is 1.2m and there are also shallow pools to cater to the needs of the little ones. Even though there are no slides or play structures, you can let the kids bring along their own beach toys and have a ball of a time here. There is also a Zen Pool located at Pantai Beach which overlooks the South China Sea but alas that is strictly for guests aged 18 and above, so we had to give that a pass this time round. I kind of like sports which require a good aim, which was why I became the softball pitcher and darts captain back in university. So, I was naturally interested in archery too and was glad that the hubby and I managed to shoot some arrows together. Oh yeah, since being 24 weeks pregnant meant I had to give up on the flying trapeze (which I really wanted to try) and other strenuous sports, so archery seemed like the next best option for me. 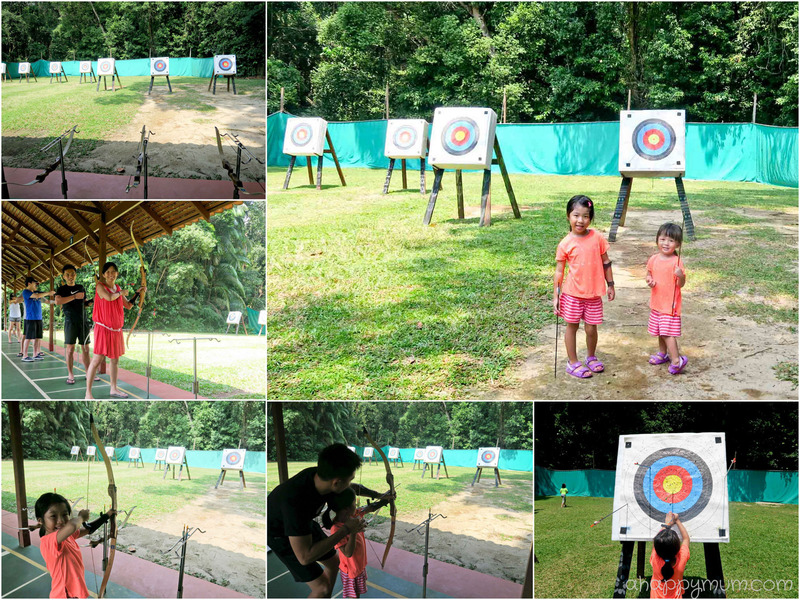 Kids aged 6 and above will be able to learn about the sport during the Mini Club activities but if your kid is not signed up, you can also find out about the archery timings and determine which 'kid' or 'family' session you can attend. The GOs were kind enough to let Angel have a go too, with guidance and help from the hubby, which was a first experience for the big girl. Though the little one could not participate, she was happy to help with the picking up of the arrows! Do note that no one is to pass the yellow line and enter the shooting arena before the GOs give permission and since this sport can be a little dangerous with the heavy bows and sharp arrows, always keep a lookout and make sure your child does not wander off on his/her own. 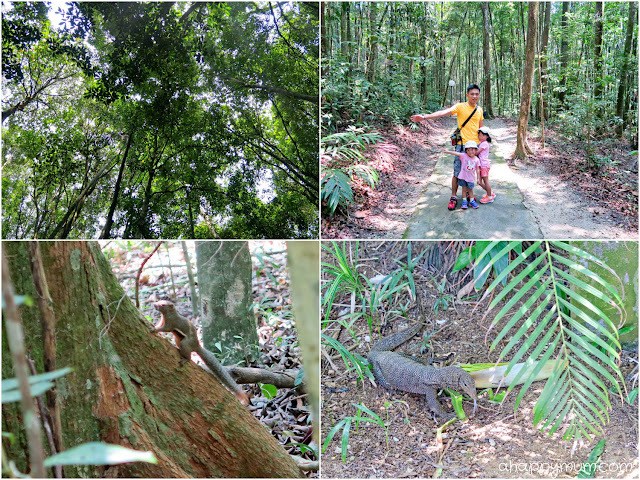 When we read that there was a jungle walk which we could explore, my little nature lovers were thrilled and we knew that there was no way we were going to miss out on this. So on the second day morning after breakfast, we armed ourselves with caps, sunscreen and mosquito repellent and were all set for the adventure. 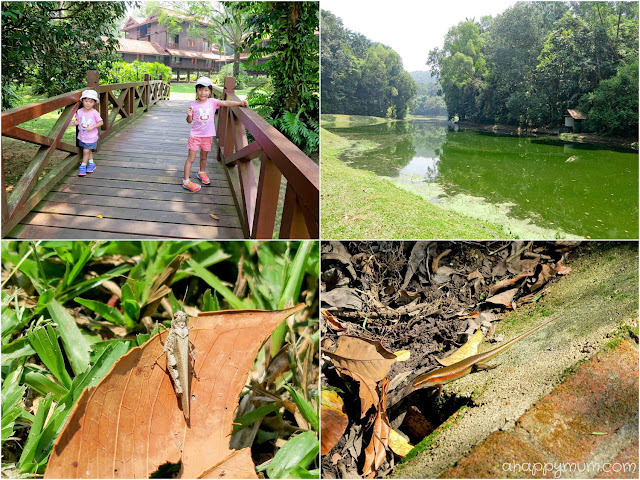 It was a bright, sunny day and I loved how we were the only ones exploring the trail and we stopped to admire everything we saw, including grasshoppers, fishes, dragonflies, squirrels and monitor lizards. I have to say that there were indeed plenty of mosquitoes here and we had to constantly flap our arms and legs in an attempt to chase them away, which did not succeed by the way. Eventually, all of us got bitten and Ariel even had a bite at the side of her eye which swelled up the next day. Yes, makes me wonder if the repellent serves any purpose. Nonetheless, we still enjoyed every bit of the walk and I'm just glad that these two didn't complain about the itch, heat or creepy crawlies but kept a curious, open mind throughout. Every time they saw an animal figurine along the way, they would exclaim "Look, a snake/monkey/tiger/toucan!" and insist on striking a pose and taking a picture with it. Kids are just so funny at times, right? At the end of the walk, which took us about half an hour, we felt a sense of achievement and it was definitely a precious memory for us to have been there and done that together as a family. If the weather is not good or if you just don't feel like being under the sun, rest assured that there are many indoor activities to choose from too. 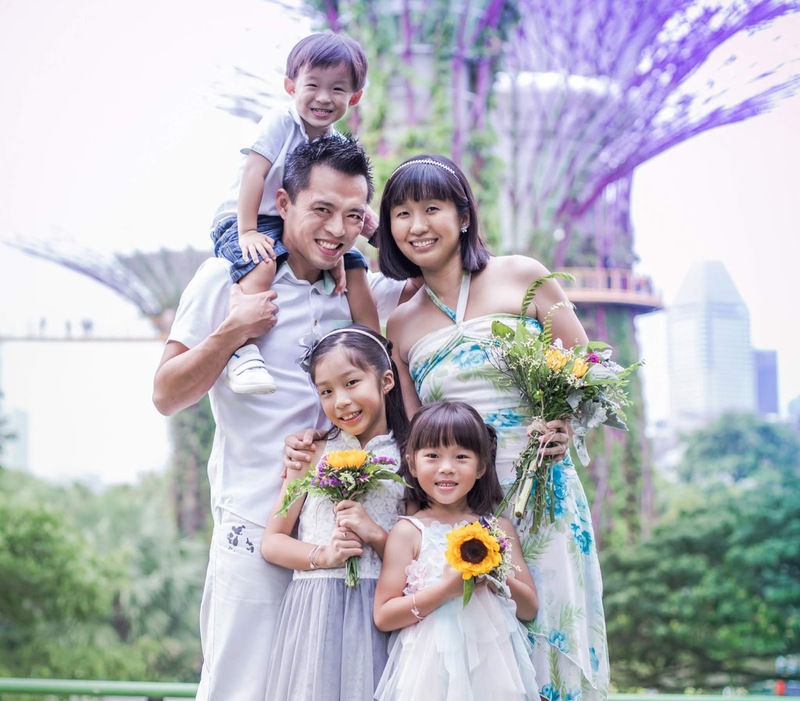 These include sports like squash, badminton and table tennis or leisure activities like mahjong and karaoke. If you have the extra money to spare, you can also indulge in a luxurious spa session at the wellness centre. If you wish to purchase a souvenir or are in need of apparel, toiletries or daily essentials, the boutique can meet most of your needs. I remember I was talking to one of the friendly GOs, Clayton, right outside the shop and Ariel happened to lose her footing and fell, so she came up to me crying. He left us and then returned shortly with two cute turtle plush toys as gifts for the girls, even asking them to name the turtles and to tell him later on. How sweet, right? 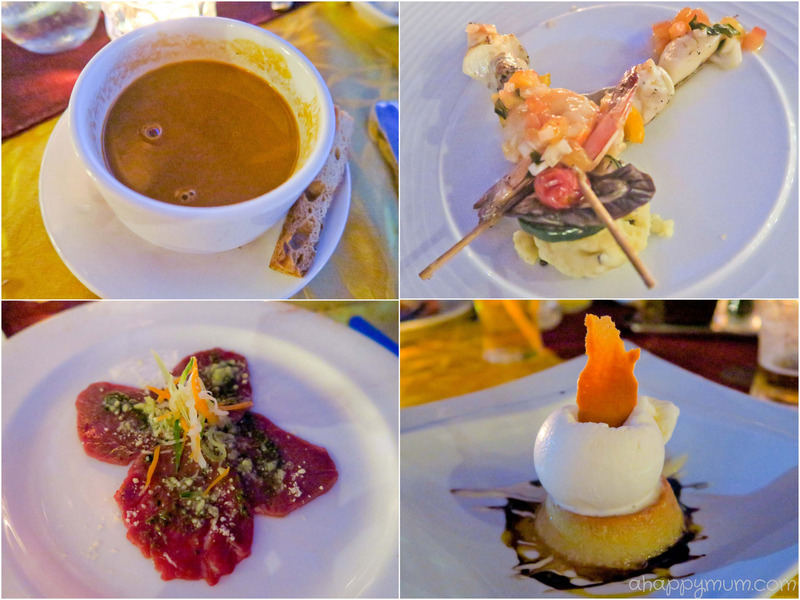 Moving on, it's time for us to tuck in and show you one of the highlights of a Club Med holiday - the glorious food! 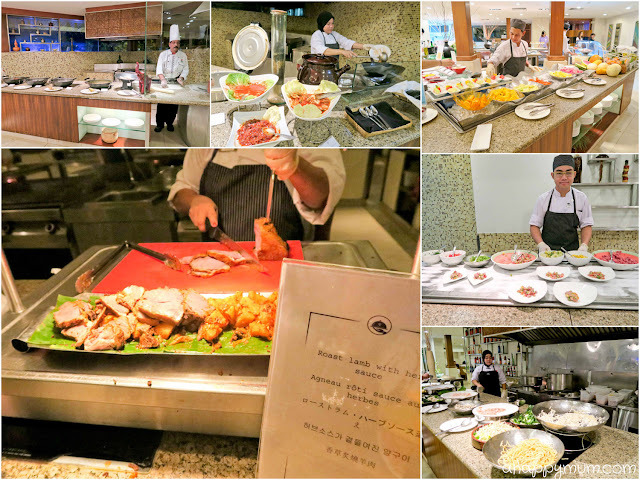 By now, you do know that one of the most enjoyable parts of a stay in Club Med is how you can feast like kings and queens, enjoy widespread buffets and sumptuous à la carte meals which are all included in your package, right? The main dining restaurant is The Mutiara which is conveniently located around the pool. 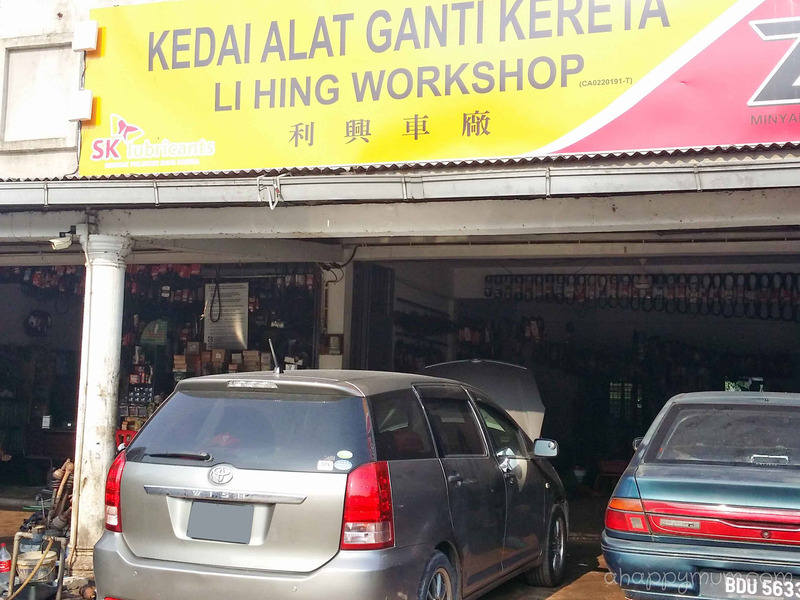 It has a cosy interior and is fully air-conditioned with tables to sit two to right people. High chairs and booster seats are available and there is also a baby corner where parents can prepare meals for the little ones. 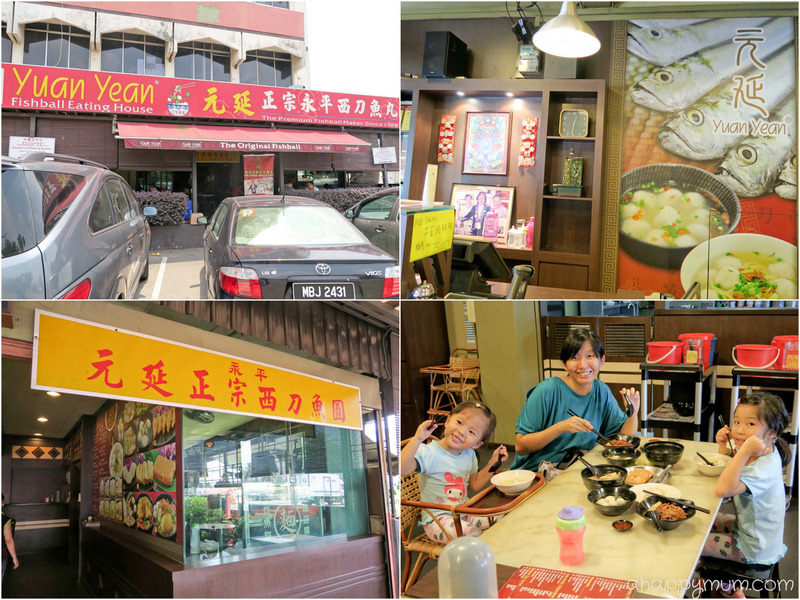 There is a wide range of cuisine to choose from, including Chinese, Indian, Western, Korean and Japanese. At every station, there will be a staff to assist you should you need any help. The Mutiara was where where we had most of our meals, including our daily breakfasts and dinners on most days. Sometimes, the friendly GOs would also join in and sit with us, and we loved making new friends and learning about more the Club Med culture too. The hubby was happy to see that congee was served and so he would pick his own condiments and make a bowl of congee for the kids every time. 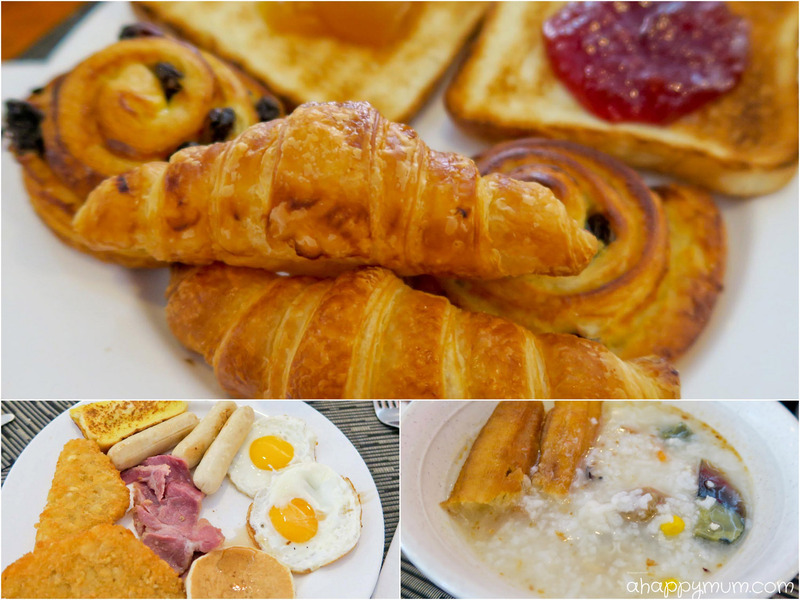 For breakfast, you get most of the usual offerings like hash browns, eggs, pancakes, sausages, bacon, pastry and so on. Dinner was a tad more exciting and we would be interested to find out what dishes were being served every night. 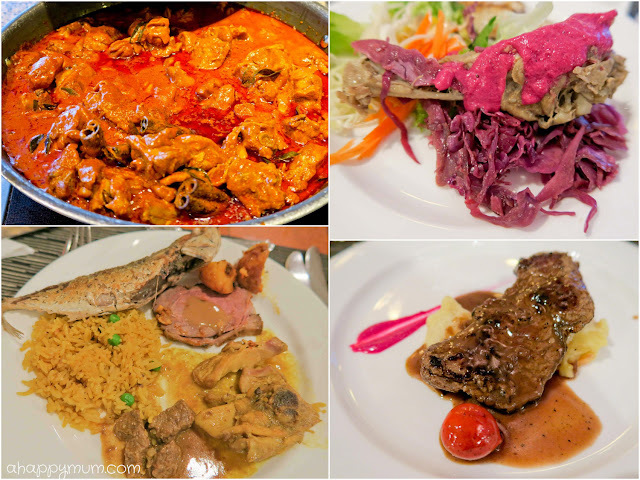 The hubby liked the freshly fried tenggiri fish while one of my favourites was the duck confit served with chutney and red cabbage. We have to frankly say that although we did enjoy the spread of food, it would not be true to say that they can match up to the cuisine you find in a Michelin starred restaurant. So, you learn to appreciate the variety more than the taste and we were just thankful to know that there was always something to eat somewhere in Club Med. And what delighted the kids most? 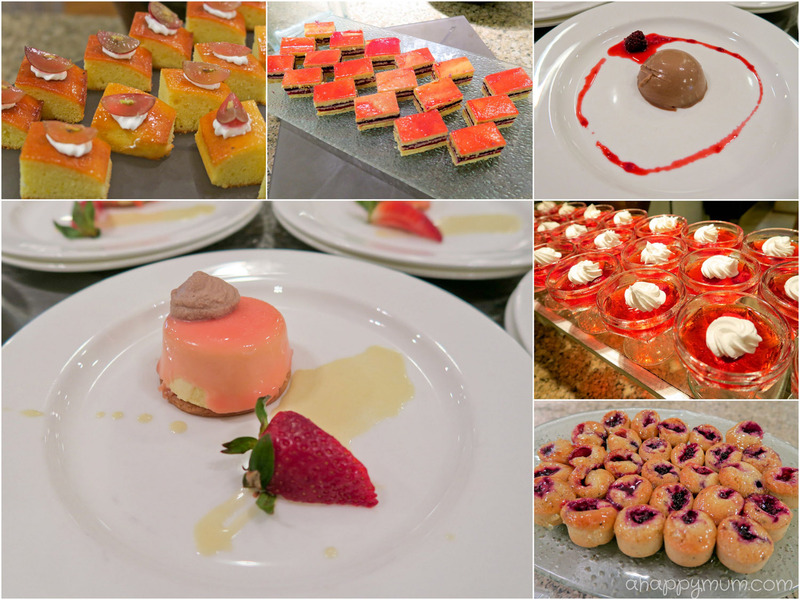 Why, desserts of course! Actually, I really mean ice cream. If you have a sweet tooth, you will be happy to know that there is a wide selection of desserts for you to choose from and for the more health conscious, there's always the fresh fruits section too. 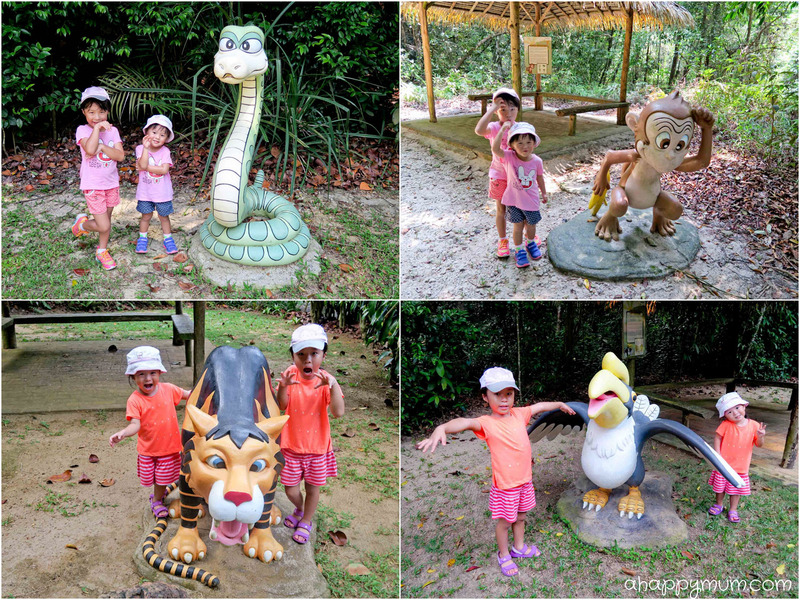 Remember our jungle walk? That route would directly lead you to The Rembulan restaurant which is located beside the Pantai beach that offers sports activities like sailing, kayaking and rock climbing. Set in the beautiful gardens with the calming sea as its backdrop, The Rembulan is a more intimate restaurant which welcomes guests for lunch and dinner in a relaxed atmosphere. 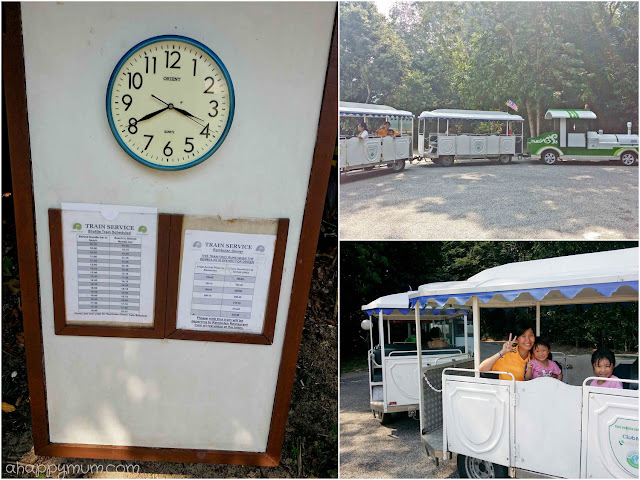 Of course, not everyone will be keen to do the jungle walk every time in order to get here so it is a good thing to know that there is a complimentary train service that runs to and fro the resort every half an hour. Yes, the GOs told us it was a train and we kept thinking it was a shuttle bus till we saw it for ourselves. The train timings, pick up and drop off points are clearly indicated at the notice board so make sure you plan your schedule beforehand. After our jungle walk, we decided to have lunch here and I must tell you I thoroughly enjoyed the lamb chops! These were really tender, juicy and succulent and we ate up the very last piece of it all (actually we were the last to arrive and leave the restaurant too). For the kids, they had more limited choices and these would include pasta, nuggets, mashed potato and french fries. As seats are limited in The Rembulan, note that booking is compulsory for dinner sessions and you can make your booking at the reception in the resort. We also decided to try out dinner here one evening after letting the kids play at the beach. I must say that the ambience here gets so much more romantic at night and if you are sitting at the terrace, it can get quite dim (we requested for four tealights instead of one to let the kids see more clearly). The food served here was more exotic and we had a full course dinner consisting of a soup, appetizer, main course followed by dessert. While I couldn't appreciate the beef carpaccio which was raw, I did enjoy the graviax salon and bisque prawns soup which were both quite tasty and flavourful. As for the main courses, the hubby chose the grilled seafood skewer and once again, I went for lamb. The mustard and herbs that accompanied the lamb were surprisingly a welcome addition and both of us agreed that this was probably the best we had for the entire stay. We ended off the evening with a sweet apple crumble and cream caramel with ice cream. How perfect! 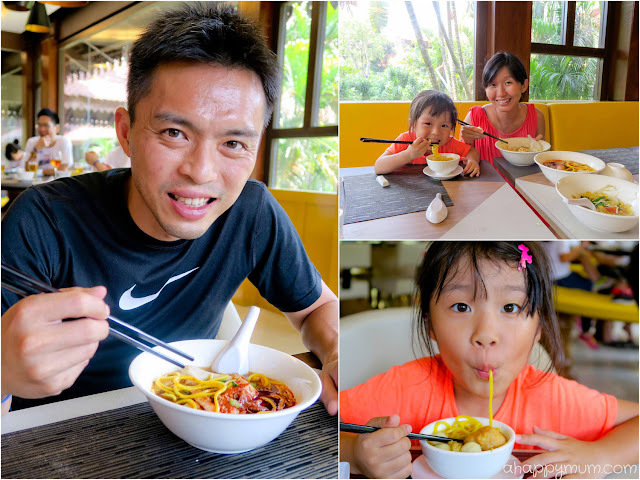 The Noodle Bar is an addition to the main restaurant and welcomes guests from 2.45-6.00 pm and from 9.45-11.30pm. Yes, even at these odd timings, you would still be able to enjoy a hot bowl of noodles. Initially, we did not plan to eat at the noodle bar but on one evening, we had to be out for a tour by 6:45pm and the GOs advised us to have an early dinner at the Noodle Bar since the Mutiara was not yet opened. And boy, we were so glad we came! There were only four types of noodles served on the day we were there, which included spicy prawn noodle soup, fishball noodle soup, vegetarian noodle soup and curry noodles in Japanese style. We were told that the menu varies every day and one of the most strongly recommended dishes would be laksa! 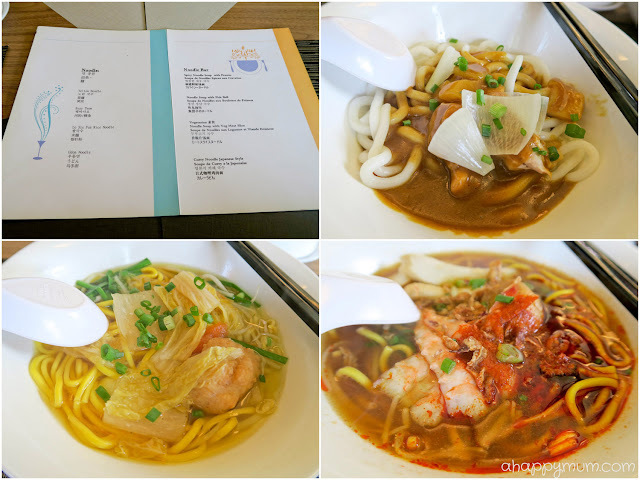 Nonetheless, we were very pleased with what we ordered and I particularly liked my curry udon! Oh, you can choose the type of noodles you desire for your dish, including yellow noodles, kuay teow, rice noodles and udon. The girls were also delighted with their fishball noodles and gobbled up every bit of it. As for the hubby, he said the spicy prawn noodles were really very spicy but nonetheless ate it all up. In fact, he requested for a second bowl without the chilli oil so it was less spicy and between the two of us, we finished everything! Yummy! Good food, fun activities, great company. There's really nothing more a pregnant mummy and two kids can ask for from a family holiday. This marks the end of the first post and I still have much more to share with you from the trip, including our beach moments, an enchanting firefly tour and all the night activities we did, especially the girls dancing to the famous Crazy Signs dance! So, do stay tuned for more! GIVING OUR FAMILY ALL THESE HAPPY, PRECIOUS MEMORIES! To find out more about Club Med Cherating Beach, visit their website or Facebook page. Parents with little ones can also sign them up for the Baby Club Med (4 to 23 months) or Petit Club Med (2 to 3), however these are optional and come at extra cost. Advance booking is advised. For more information, go here. Good news, again! 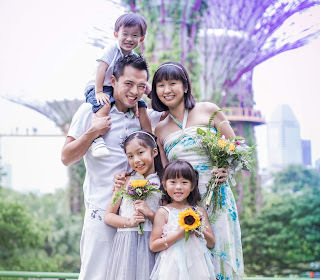 After giving away a family stay package to one lucky reader last year, I'm thrilled to annouce that I'm sharing the joy of holidays once again! Woohoo! 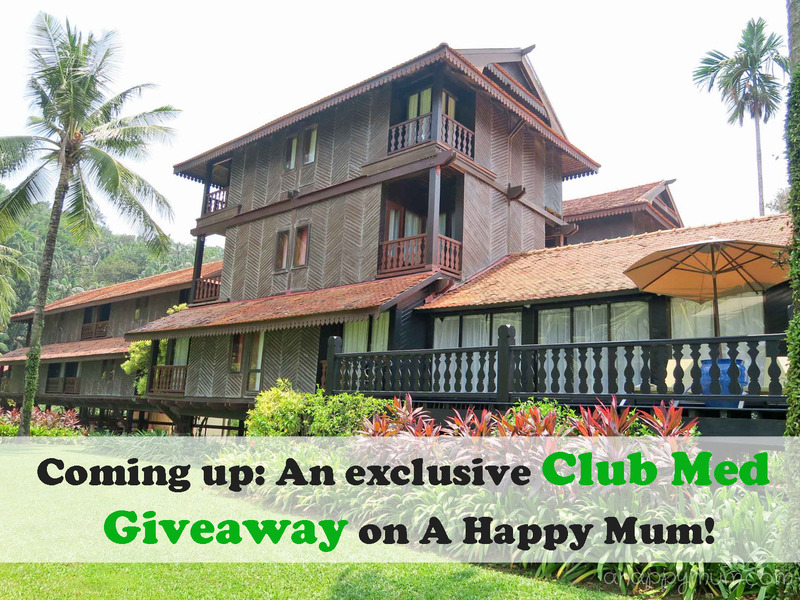 I'll be giving away a 4D3N family stay (for 2A2C) in Club Med Cherating Beach, the first ever Club Med in Asia! So, don't forget to watch this space for the second post so you can participate and stand a chance of winning a dream holiday for your family too! Disclosure: This is Part I of a two-part series of conversations between Club Med and A Happy Mum. 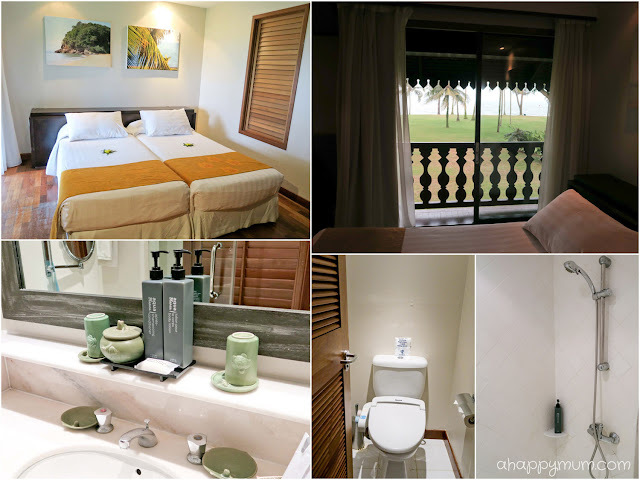 We were sponsored a 4D3N resort stay in Club Med Cherating Beach in writing this review. All opinions are our own. Look so fun! But I don't think I can survive 6 hours of road trip myself haha! Haha Europe trained us well! We even did a 3-week road trip before and visited over a dozen cities in that holiday alone! =) Ok, credit must be given to the hubby because I no need to do much except keep passing snacks to the kids and be the DJ! Lol. Wow looks fun!! Yikes 30kmh! Thank goodness you found a mechanic along the way! Lovely pics and the girls look so happy!!! Sounds like you had a wonderful time :) the longhouse - so cool!! I remember learning about them in history books!! History books! Ok, I was never good in history, haha. Not good in geography too but chose to go with the latter. The kampong feel is something very different from some other modern hotels or resorts we've been to and I quite like it! glad that help came just when you guys needed it! your girls are so adventurous! not sure if my scaredy-cub is up for the club-med style of activities yet. haha! Your daughter is so brave to try the flying trapeze! My kids wouldn't even dare, I'm sure. And love the matchy matchy clothes your girls were in almost everyday! =D Definitely looks like a great option for short trips out of Singapore. I want to win!! Club Med is definitely THE place to go for a relaxing family vacations. Though I'm not sure I fancy those monkeys outside my room. But wait.. I just went to Leofoo where there were all kinds of animals outside my window. So I guess with the doors and windows properly shut, it would indeed be kind of amusing for the kids! I am always amazed at the abundant activities and food at Club Med.